What is the policy for learning in the School? What are useful links to learning information? Home learning is an important feature of school life. It allows pupils to develop the habit of study, to plan work within specified time limits and to undertake additional tasks which will be a reinforcement or extension of work done within the classroom. Home learning can take various forms and will vary from subject to subject. It will largely be in the form of written exercises for return to the class teacher or may be revision of work done in class. Pupils may also be asked to undertake the reading of material in preparation for future lessons or general reading. The development of the reading habit is of great benefit to all subjects, not just English. Our PHS Bookchat initiative aims to promote this habit. Learn more by following @PHSbookchat on twitter or reading our regular column in The Peeblesshire. The amount of time spent on home learning will vary from child to child and will depend upon year stage. Many of our teachers use Show My Homework to post homework tasks. You can find out more about Show My Homework on the school website. Senior pupils should be applying themselves regularly and consistently to private study for a considerable part of each evening and over parts of the weekend. This is essential if they hope to secure good grades in national examinations. Where there is a supportive partnership between the school and the home, a pupil’s progress is greatly enhanced. Parents can help support the school in this area by checking their child’s homework schedule, by helping to set aside a quiet area of the house for home learning, by helping the child to establish routine schedules for the completion of home learning and by providing a suitable schoolbag. Parents are asked to let the school know whenever circumstances have prevented their child from completing the work set. Teachers will inform parents if home learning is not completed on time, or if the standard of work done is not satisfactory. Parents’ interest in their child’s education generally is much appreciated and co-operation between parents and teachers should ensure the most efficient learning by every pupil without an excessively demanding amount of effort and time. Parents can also help by monitoring the effect which any part-time employment may have on the ability of their children to complete home learning. Our examination results at Peebles High School are very good and we are naturally very pleased with the achievements of our young people. However, we wish to stress to parents that examination results represent only one of the school’s many activities. As a school, we value and encourage all kinds of achievement. We believe that the development of our pupils into confident individuals, responsible citizens and effective contributors is every bit as important as their academic success. We work closely with our young people to set ambitious targets for their learning and we are delighted with how they have responded year on year to bring themselves and our school such a strong reputation for high attainment. In March 2017, The Herald Newspaper reported Peebles High School as one of the top 20 attaining schools in the country with 54% of our leavers attaining 5 Highers or more; this was 10 percentage points ahead of schools with similar cohorts. 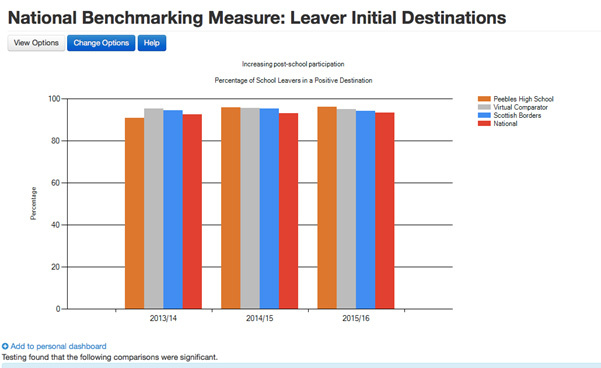 The following tables show Peebles High School’s performance in the four key measures of: percentage of leavers attaining literacy and numeracy; percentage of school leavers in a positive destination; attainment versus deprivation and average total tariff score. NB: The ‘virtual comparator’ is a virtual school made up of students whose backgrounds and prior attainment match those of Peebles High School pupils. 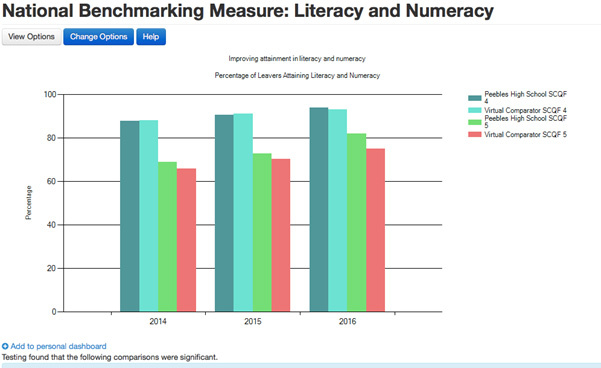 The above shows the percentage of our leavers who have attained National Qualifications in both Mathematics and English at Levels 4 and 5 over the last three years against our Virtual Comparator. 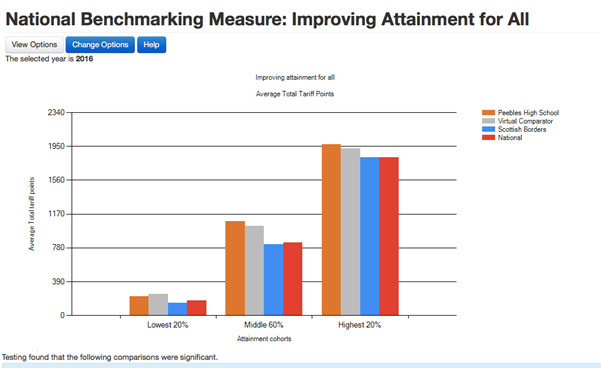 The above shows the relative performance of our young people across all subjects. 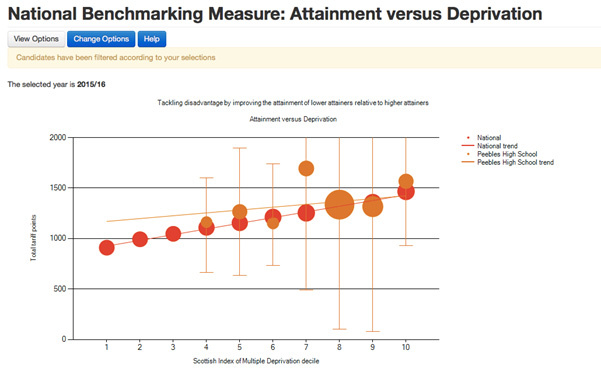 The above shows the attainment of our young people in relation to their SIMD (Scottish Index of Multiple Deprivation). What is an improvement plan? The school improvement plan is published once a year and is the reflection of the school’s priorities for the coming academic year. It is usually based on feedback from staff, pupils, parents and external bodies eg HMI reports see more . The curriculum aims to ensure that all children and young people develop knowledge and skills in four key capacities – as ‘successful learners, confident individuals, responsible citizens and effective contributors’. For a quick, general introduction, we suggest see this. For fuller information, see Education Scotland. How are classes streamed going into S1 from Primary School? Only Maths is streamed in s1 but as progression goes beyond S1 this happens across all subjects according to testing at the end of modules of learning and course work. In some classes in s1-3 there are formal exams particularly in Maths. This leads to further streaming in s3-6 and will be based on external exams s4-6. Which classes are streamed in S1? Maths is usually first to stream and based initially on primary school assessment , although throughout the early part of s1 this is tested regularly and adjustments made to ensure the pupil is matched closely with their learning needs. Your child may change class during the year. When is class streaming reviewed? What do I do if I am unhappy with the class my child has been put into? What is pastoral care and what can I expect from my child’s teacher? The aim of pastoral support is to ensure we have happy, settled and resilient young people who fulfil their potential. We achieve this through close co-operation between the Pastoral PTs and the Additional Needs Department. The Pastoral Support model at Peebles High School is organised on a House basis. There are three Houses: Cademuir, Dunrig and Meldon. Young people who have elder siblings are normally placed in the same House and allocated the same Pastoral PT. The House team is responsible for the welfare of all the pupils in their House and their work is therefore directed at establishing very strong personal relationships with their pupils. Subject to changes in staffing, Pastoral PTs and House Heads will move up through the school with their year, getting to know more about each child as a person. As pupils progress through the school, staff will provide different forms of support and advice – personal, social, academic and vocational. At certain points Pastoral staff will be actively involved in helping pupils when important decisions have to be made, e.g. choosing subjects, or careers advice for senior pupils. At other times throughout the year they will be available on a regular basis to help with problems and difficulties. Pupils are encouraged to approach their Pastoral PT as soon as possible if experiencing any difficulty. Equally, staff will welcome early contact from parents concerning any problems facing a child. An early conversation can often prevent longer term anxieties which may affect a pupil’s progress. It is very important that parents keep us informed of changes in circumstances or personal details. Strategies for supporting any pupil who is causing concern may be discussed at weekly House meetings. Parents are requested to contact the school by email or telephone to arrange an appointment as Pastoral PTs also have teaching commitments. In cases of urgency, however, parents are welcome to visit the school and one of the senior staff will be able to meet them. Pastoral PTs seek to give support to pupils through formal and informal interviews and through Personal and Social Education classes. In PSE classes the pupils are encouraged to look at their personal aims, aptitudes and abilities, to consider their relations with their fellow-pupils and with adults and to examine their behaviour and responsibilities. From S2 onwards, careers advice begins to play an increasing part in guidance work and to this end staff liaise closely with Careers Service staff based in the school to provide up-to-date information on careers and further and higher education. How do I find out who my child’s pastoral teacher is and how do I contact him/her? Who is in charge of supporting my child with specific learning needs? If your child has specific needs highlighted in one subject area then this is the responsibility of the class teacher in partnership with yourself and the pupil. If the needs are broader across many subjects and required additional needs support the team of specialised teachers from the additional needs department will liaise together with guidance staff to put a plan in place for a child in partnership with parents and pupils. Any concerns contact guidance first of all. When are parents of S1 pupils given the opportunity to visit the school? In the first term parents are usually invited to an open evening to look around the school and meet teachers informally. Later, in the second term, a more formal parents’ evening is held. However, if you have any worries in the interim, please contact the school. How do I find my way about the school on parents night? What support for pupils is provided? One of the aims of Peebles High School is to provide an environment within which all young people realise their full academic potential. Personal Support classes are designed to provide additional support with learning for all young people and to build their skills to help them become resilient, independent and reflective learners. One period per week is devoted to Personal Support and Personal Support classes are organised within House groupings. Every class has members from S1 to S6 and is assigned two Personal Support teachers. These lessons aim to coach young people so they learn to focus on overcoming any barriers they have in learning and to engender a positive and self-reliant approach to achieving their full potential. Every young person will receive at least six one to one coaching sessions per academic session allowing them to build a positive and productive relationship with their coach and to reflect on how they can identify and achieve their next steps and improve their learning. The rest of the time in Personal Support class is devoted to independent study; this can include working with other students or completing independent revision or homework as directed by the teacher. It is our expectation of every young person that they bring work to complete/revise to every Personal Support session. How are my children looked after? What happens if my child becomes sick during the day? What happens if my child needs medication during school hours? How do I put money on to the canteen card? The school uses an online system of prepayment for school lunches called parent pay that you may be familiar with from primary school. You need to contact the school office if you have not yet received information on how to sign up. This system automatically tops up your child’s card. Students can use cash to top-up their cards at the payment machines in the school. They will receive a PIN number for those cards that they must remember and keep confidential. They can then use the card to buy their lunch in the dining hall or from mobile lunch vans in the school grounds. If children have lunch clubs they are able to pre order a “grab and go” packed lunch for speedy collection before going to their lunch club, alternatively they can bring a packed lunch to school. What types of food are available?